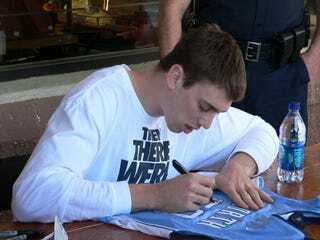 Here's Tyler Hansbrough signing autographs before a barnstorming tour stop in Gastonia, NC— the home of Sun-Drop, Fred Drust, and James Worthy. Mr. Psycho T looks very intelligent while signing his masterpiece. For those not familiar with "barnstorming," read this article. It's a big deal in North Carolina.